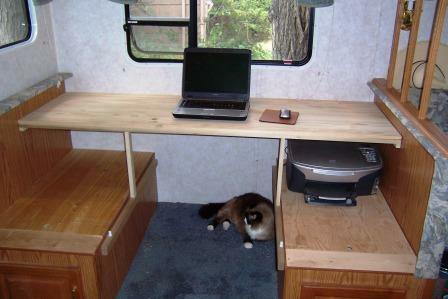 Whittling out a built in RV Desk provides me with a dedicated piece of RV furniture that will help organize my work and reduce some of the confusion that can happen when you have a lot going on in a small area. Sitting at the old dinette was OK I guess - but still lacked a lot. Any notebooks or other goods I needed were always somewhere else... even the printer was 10 feet away and couldn't be kept ready to go. I needed to run all the wires any time I wanted to print something. What a sticker in my hind parts. Our rig is fairly small, as full-time RVs go. At only 30 feet, space is sure at a premium, so putting in a desk pretty much dictated that something else was gonna have to go! My first thought was to take out the couch. With that gone, I could put in a recliner chair and fill the rest of that end of the slide with a small desk. I figured it would work as the chair would be for Heidi - the end of the couch is where she sits in the morning and again in the evening doing her knitting or beading and such. I, most of the time, sit at the dinette, at the other end of the slide, writing/surfing on my laptop. Sort of an improvised RV desk. On occasion, we have someone visit overnight... or accompany us on a short trip... and Heidi is of the opinion we might want to retain that last 'auxiliary' bed. I was still thinking that the RV Dinette would do double duty as my RV Desk.... another time in the growing list of times I wasn't exactly right. It was OK but not a proper RV work station. So it was back to the drawing table. As I see it, there were only two other options. One would be a little portable stand, RV desk, that I could use sitting at the couch. Well, that would give me even less space than at the dinette, and Heidi and I would be right on top of each other. That can be kind of fun at times.... ahem! .... but, when trying to get something done on the computer, I'm thinking it would be a major distraction. 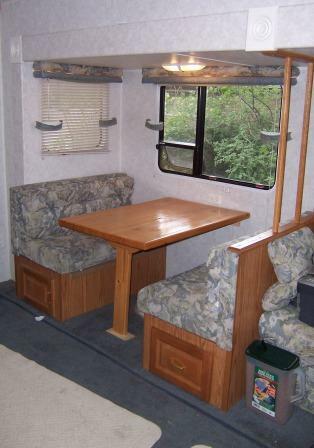 That leaves but one place for an RV desk, and that is the dinette area. Truth is, we have seldom used the dinette, as a dinette. In camp we most usually eat outside. If it's drizzling we'll eat under the awning. The weather has to be awful windy or cold before we get pushed inside for our meals. With that in mind I calculated that losing the dinette itself wouldn't be to big a hardship. As a replacement We're getting one of those 'Roll-a-table' gizmos. We can use it outside, under the awning, or inside in front of the couch. In a pinch, we could seat two eaters on the couch and two more in fold up chairs on the other side... if it were raining. So now with the dinette 'issue' taken care of and it's back to the RV desk. 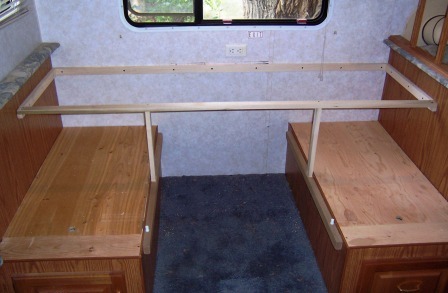 I thought about just tearing out the benches and putting in a regular desk as my RV work station, but not for long. You never know for sure what might happen down the road, and I thougt it might be better to maintain the ability to return the rig to it's original layout if we should want to trade sometime. That and I decided I needed to hold on to the storage areas under those benches. I went to sketchin' and it didn't take long to come up with a pretty simple design for a workable RV desk. All it took was some 1X2 poplar, a piece of laminated/butcher block pine from Home Despot, and a few screws. First thing was to remove the existing table top and cushions. Those went to storage.... at least for now. Second, cut and place the ledgers, from the poplar, that will hold the Pine RV desk top. To ensure a sturdy enough structure, I put a pair of intermediate legs on either side of the center. That 72" span was just a little to wide to go, unsupported. Especially considering that I'll be bangin' on there tooling leather. As it is, it'll work out pretty fine. Right along in here is where I ran into one, small snag.... I couldn't find the small handsaw I planned on putting in the rig... My guess is it got unintentionally 'diverted', either to our storage goods, or my daughters house when we were packing up the house. So rather than spend the time and fuel trying to run that down I picked up a small, japanese style 'pull' saw when I was picking up the RV desk materials. It's a handy little thing, built by Marples. I'm thinking it may come in handy for little camp projects I'm thinking of. Third, I trimmed the RV desk top pine panel, notched it in a couple spots (where there are trim pieces on the wall) to fit flush against the wall, and set it in place. I glued it and pinned it in position with a 16 gauge finish gun.... since that had been taken to my daughters place... that task had to wait until I could temporarily retrieve it. 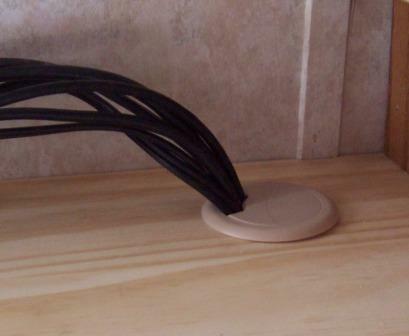 To keep the wires necessary for the computer, printer, cell phone charger etc. neat and orderly I cut a 'grommet' into the desk top, to run the wires through. With the simple RV desk framework and top put together the only thing left was to apply a finish and set the printer and drawer unit in place. I opted for an all in one polyurethane finish for simplicity. I've used it before so I'm confident it will work well. The drawer unit is a simple, plastic, organizer type of setup from the always handy Wal Mart. Moved the printer from it's 'hidden' location behind the television, put my chair together (also from Wal Mart) and my new RV work station is complete! It's kind of amazing how much difference such a simple change can make. The additional space; the organization with the drawers and such; makes for a huge improvement in convenience. One little thing I plan on doing... when I get around to it... is to cut a couple pieces of formica type laminate to lay over the top of the original dinette benches. I don't want to fasten anything down there as those panels are removable for access to the back of the compartment. All I want to do is lay a 'cosmetic' panel on top. If you're going to 'work' in an RV - I think you should put a lot of thought into consideration of a dedicated RV desk. It can have a pretty big impact on the work you do. At least for me, any amount of hassle I can eliminate is a good thing. Confusion and clutter aggravate me more than I can say. Pretty quick I cease to function and just walk around with a major 'grump' on! Not a fun deal for the people around me. 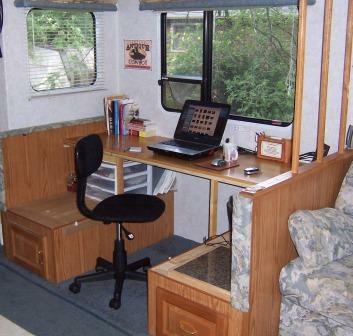 Having a good RV desk to work at goes a long way toward eliminating that confusion and clutter. It can be as simple as my installation... or you can have a cabinet maker build you a genuine piece of furniture. Either way, having an RV Desk, a proper place to work, that eliminates aggravation, fits into my idea of simplification.